Irving Zisman’s (Johnny Knoxville) wife, Ellie (Catherine Keener), just died. Before you feel too bad for him, he sees it as a happy day. He is finally free. At her funeral, Irving is told by his daughter, Kimmie (Georgina Cates) that she is going to jail. As a result, Irving must take his grandson, Billy (Jackson Nicoll) to be with his deadbeat dad, Chuck (Greg Harris). No one is particularly excited about the road trip, especially Irving, with his new-found freedom. The movie chronicles Irving’s trip across the country to North Carolina with Billy. Along the way, they come across a variety of people and find themselves in all sorts of inappropriate situations. Jackass Presents: Bad Grandpa is a movie where the cast has elaborate plans for interacting with real people (people who don’t know they are in a movie) and their reactions to the events unfolding in front of them. For reference, think Borat: Cultural Learnings of America for Make Benefit Glorious Nation of Kazakhstan. The premise behind the story is a bit of a stretch, to say the least. And the transitional scenes between Irving and Billy interacting with real people are a little lacking. Aside from what appear to be ad-libbed scenes between the two. These can be genuinely funny. The funniest being those where Johnny Knoxville breaks into real laughter, rather than his character laughing. As you would expect, the meat of the film is when Johnny and Jackson come across groups of unsuspecting locals and put them in all sorts of uncomfortable situations. There is a real payoff to how the people react. For example, I was surprised by the existence of the motorcycle gang at the end of the film. I was also afraid for the cast at this point. Things could have gotten messy quickly. I found the film funnier than I expected it to be, considering I have never been a fan of Jackass, despite having never seen any of the movies or tv show. Overall, I think Bad Grandpa pulls off a film of this “genre” much more successfully than Borat. I was surprised to see Catherine Keener in full makeup as Irving’s now dead wife during the end credits reel. She was completely cut out of the film. I’m sure this was done to cut time, but it might have been nice to get some history behind the couple. And I would be interested to see her in some of these types of situations, as I don’t see her in this type of role. It was a surprise to see Bad Grandpa up for an Oscar, even if it was for Best Makeup. That is, until you see the film. Typically, when old age makeup is used, it comes across very fake looking. Not in this movie. It is so well done that if you didn’t know it was a Johnny Knoxville movie, you would not have recognized him in the role. Every detail was expertly done, down to the age spots and sprouts of hair coming out of Irving’s ears. Kudos to the makeup department. 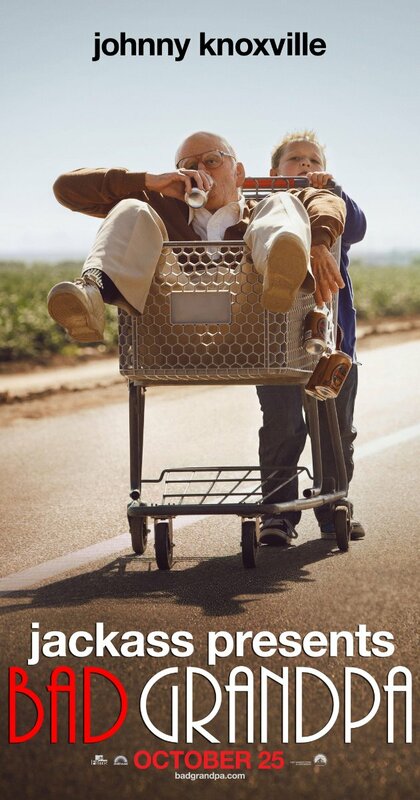 If you are into over the top situational comedies, even if you don’t care for Jackass, you will be pleasantly surprised, and entertained, by Bad Grandpa.